I love watching food programs on TV. One program that has almost turned into an addiction is Come Dine With Me on BBC. Four or five amateur chefs competing against each other by hosting a dinner party for the other contestants. Each competitor then rates the host's performance. The winner gets £1,000 cash. The contestants are of the people-next-door type, although the combination of people adds the zest. The comments of the sarcastic narrator make it a true comedy. I watch it for easy entertainment more than for the actual cooking. However, I couldn't help noticing that many British people seem to like things mashed. Why on earth would you mash peas, carrots, turnips, beans, cauliflower? It's mashed and then the mash is put next to the fish, or meat. That's it. I asked my husband why he thinks the mashing was so popular. His reply was that by mashing you can hide overcooked or undercooked food. Is that so? Please, enlighten me. I hope I don't sound too critical, as there is British food that I absolutely relish: oatcakes for example. I was quite happy with the store-bought ones until I saw a recipe for thyme-scented oatcakes on My Custard Pie, a fellow Dubai food blog. The ingredients list couldn't be any shorter. All ingredients are as healthy as can be. And I love the fact that these oatcakes do not contain any flour of sorts. So off I went to get the thyme. And decided to make them, when I had only 30 minutes left before I had to leave the house for some errand. 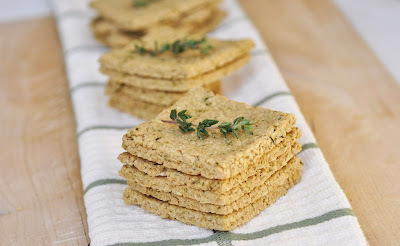 I got them done in that time and they turned out beautifully: these crackers are all oats and thyme, just as the ingredients list promises. They keep crispy for days. And that means a lot, especially here in Dubai where high humidity makes every crispy cookie into something rubber-like within 24 hours. These oatcakes will be a hit on any cheeseboard. Or as an appetizer with cream cheese and smoked salmon, or whatever savory topping you prefer. A definite keeper!!! Preheat the oven to 180C/375F. Line baking sheet with parchment paper. Measure the oatmeal, oil, salt and 2/3rds of the fresh thyme into the bowl of a food processor. Whizz until everything is combined well. While keeping the motor running, pour in the boiling water, one tablespoon at a time. You might need less than 8 tablespoons. So be careful from the 5th spoonful on. After 30-45 seconds the mixture will begin to come together and look sticky and thick (switch off, scrape down and repeat if it doesn’t). Add the remaining thyme and pulse a few times to chop it roughly. Gather the dough up into a ball, with your hands or a spatula. Place on a floured board and roll out, while still warm, to about 2mm thick. With a cookie cutter, cut out rounds or any any other shape and place on the prepared baking sheet. Bake for 15-17 minutes until lightly colored. Cool on a wire rack then store in an airtight container.